During the holiday season of giving, the HSA invites our Harbordale families to join us in showing our teachers and staff how much we appreciate them! 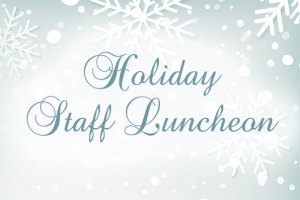 On Wednesday, December 5, we will be holding our annual Holiday Staff Luncheon. Rumor has it this is the teachers’ and staff’s favorite day! We are asking our Harbordale families to contribute your favorite pot-luck style dish or dessert. No time to cook? We are also asking for drinks, fruit trays, and volunteers to help set up, serve, and clean up. If you wish to make a monetary donation for this event, go to our Donation Page! Be sure to indicate the target donation is listed as Holiday Staff Luncheon! Please see the sign-up sheet for items needed and more details. We thank you for your help with this wonderful event! If you have questions, please contact Kim Falcone at kimfalcone@gmail.com for details.